Buying a Home in the South Okanagan? Congratulations on buying South Okanagan real estate! The Penticton, Naramata, Oliver, Osoyoos and Keremeos areas are booming so it makes sense to work with experienced real estate agents who have in depth knowledge of the market. While CRUSH enjoys selling homes for our clients, we love helping clients buy the perfect property in the South Okanagan. We excel at helping home buyers because we really listen to get a sense of your needs. Maybe you’re a first time home buyer in Penticton, a retired couple looking for a waterfront property on Lake Okanagan, or moving from Vancouver or Calgary to raise your family in the South Okanagan. We make sure we completely understand your individual needs before showing you your options. We know that you are the one who will be living in the home and paying the mortgage, so making sure we pair you with the right real estate is our number one priority! What Should I Offer for a Home in the South Okanagan? There are several factors to consider when deciding how much to offer for a property in the South Okanagan: the listing price of the home, the prices of comparable properties that have recently sold, and of course what you can afford. Listing Price: Also called the ‘asking price’, this is a rough estimate of what the seller would like to receive. It is important to consider how long the property has been on the market for and if there have been any price reductions. Other factors that should affect how seriously you consider the listing price include whether the property is a foreclosure or short sale, and if there are multiple offers being presented to the seller. Sales that have occurred within the last three to six months in the South Okanagan real estate market – the more recent, the better. Sales of properties similar to the one you’re making an offer on, in terms of age, size, and bedrooms and bathrooms. Sales within a reasonable proximity (six to ten blocks in an urban area; please consult us in rural areas) of the property you are making an offer on. This radius may need to be reduced if a freeway or other dividing line splits the neighbourhood. Once you have considered the factors at hand, it is time to decide on a number. In competitive areas or ‘hot markets’ like the South Okanagan, you may have to offer no less than the asking price. You should be mentally prepared for negotiations, and in some cases even bidding wars, which can erupt among aggressive buyers. In hot markets like the South Okanagan right now, properties can often sell for 10% to 30% above the asking price. If you are making an offer in a hot market, you may need more than just a well-priced bid. Considering the seller’s needs is the best way to achieve an advantage in the competition. Your ability to close the deal quickly is often an advantage. For example: buying with all cash or having your loan pre-approved tells the seller that you are a serious buyer. Your flexibility and accommodation of seller time frames can also be beneficial. For example: extending the closing time frame for a party that cannot move for several months; or making your offer for the property ‘as is’, meaning you will pay for any needed repairs. In less competitive areas, or ‘cold markets’, you will have more room to negotiate with the seller at a lower purchase price. REO, short sale and Bank Owned properties can often be obtained at great prices, but be prepared for a long and challenging closing process. When buying a home in Penticton or other parts of the South Okanagan, it is helpful to determine the type of home you’ll like and how much you can afford before beginning your search. Most lenders allocate approximately 28% of your GROSS MONTHLY INCOME to housing expense. Housing expense includes principal, interest, taxes and insurance (PITI). To get an idea of how much you can afford to pay each month for a home, multiply your gross monthly income by 28%. Mortgage interest, property taxes, loan fees or “points” are currently tax deductible (up to allowable limits). Points are generally deductible in the year paid. A point equals 1% of the mortgage amount. If you are in the 28% tax bracket, this is equivalent to receiving a 28% discount on your mortgage interest and property taxes. During the first years of the mortgage your tax savings are especially high because most of your monthly payment goes toward loan interest. 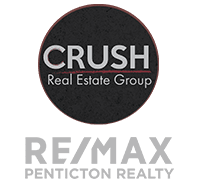 CRUSH works with a solid network of mortgage brokers in the South Okanagan and are happy to connect you with one! Contact Us to get introduced! What price for a home can I afford when buying South Okanagan real estate? How do I find out about the condition of the home I’m considering in the South Okanagan? First and foremost it is strongly recommended that you hire a professional person to inspect the home. Many home inspectors belong to the Canadian Society of Home Inspectors (CSHI). They attend seminars and stay abreast of the latest developments. Secondly some Provinces require sellers to complete a disclosure form revealing everything known about their property. Home sellers are required to indicate any significant defects or malfunctions existing in the home’s major systems. A checklist specifies interior and exterior walls, ceilings, roof, insulation, windows, fences, driveway, sidewalks, floors, doors, foundation, as well as the electrical and plumbing systems. If possible try to learn about the seller’s motivation. For example, a lower price with a speedy escrow may be more acceptable to someone who must move quickly due to a job transfer. People going through a divorce or are eager to move into another home are frequently more receptive to lower offers. Take a look through hundreds of South Okanagan real estate listings. See something you like? Contact CRUSH to book a viewing!